HSBC in Switzerland. Photo: Beat Strasser. Used under Creative Commons License. A cache of secret documents has thrust HSBC, the world’s second largest bank, into the limelight for helping international clients dodge taxes. A series of articles published by the International Consortium of Investigative Journalists is finally pushing reluctant governments to act almost eight years after the original leaks. The scandal began when Hervé Falciani, a Swiss employee of HSBC, blew the whistle in 2007 and handed over a stack of files on the bank’s clients to French government authorities, who later shared the files with officials in Spain, the United Kingdom and the United States, among other countries. The files, which cover the period from 2005 to 2007, shed light on some 30,000 account holders with almost $120 billion in assets. They show that HSBC’s Swiss bank staff routinely doled out bundles of untraceable cash and advised clients how to circumvent domestic tax regulations. Switzerland has long been a favored banking destination for wealthy people around the world because of the country’s strict secrecy laws. In turn Swiss banks have made a lot of money from these wealthy clients. 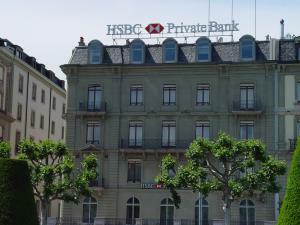 In 1999, HSBC decided to get in on the lucrative business when it bought the Republic National Bank of New York and merged it with other HSBC units to create a special Swiss division for clients around the world. Falciani’s files show that HSBC employees in Switzerland reassured clients they would not disclose details of their accounts to tax authorities in their home countries. Some documents also showed that HSBC proactively contacted clients to discuss options that would allow its clients to avoid a new tax introduced under a treaty Switzerland signed with the European Union. And yet other documents show that HSBC maintained secret bank accounts for numerous dictators, arms dealers who sold mortar bombs for use by child soldiers in Africa as well as to traffickers in “blood diamonds” – mined by warring parties in conflict zones. One of the clients listed was an Emmanuel Shallop. “We have opened a company account for him based in Dubai,” wrote an unnamed bank official in a memo revealed in the leaked files. “The client is currently being very careful because he is under pressure from the Belgian tax authorities who are investigating his activities in the field of diamond tax evasion.” Shallop was convicted in 2010 of dealing in diamonds from Sierra Leone. Another client listed in the files was Sanjay Sethi, a U.S. citizen. Sethi pled guilty to tax evasion in 2013. An HSBC banker promised that “the undeclared account would allow his assets to grow tax-free, and bank secrecy laws in Switzerland would allow Sethi to conceal the existence of the account,” according to the US Department of Justice. The leaked files provide details on clients who made trips to Geneva to withdraw large amounts of cash, sometimes in used notes. Likewise Andrew Silva, a U.S. surgeon who later pled guilty to tax evasion, admitted that HSBC’s Swiss bank deliberately gave him “bricks” of $100,000 in notes, to secretly post home in a series of envelopes. The bank told him not to wire money because that would “create a trail for US authorities,” according to the U.S. Department of Justice. HSBC says that it has “taken significant steps over the past several years to implement reforms and exit clients who did not meet strict new HSBC standards, including those where we had concerns in relation to tax compliance”. However, a progress report by an independent monitor appointed to the bank which is expected to be made public in April, is expected to show that HSBC is failing in its attempts to make substantial reforms, according to Wall Street Journal sources. The HSBC documents highlight a culture of corruption in the international banking system that goes far beyond the world’s second biggest bank, says Global Financial Integrity (GFI), a Washington DC-based research and advocacy organization. Indeed, academics estimate that at least $7.6 trillion is held in overseas tax havens, allowing account holders to underpay at least $200 billion a year in taxes. Meanwhile UK politicians have criticized the country’s tax collection agency – Her Majesty’s Revenue and Customs (HMRC) – for not taking advantage of the documents to crack down on tax evaders. U.S. authorities have also been accused of turning a blind eye. Loretta Lynch, the former U.S. attorney for the eastern district of New York and the new U.S. attorney general, has been heavily criticized for allowing the bank to escape criminal indictments in the US although HSBC did agree to pay more than $1.9 billion to settle criminal and civil investigations and entered into a five-year deferred prosecution agreement. “From a policy perspective, that’s the most troubling aspect of this: that people not expert in this made an otherwise momentous policy that this bank was too big to jail,” Bart Naylor, an expert at Public Citizen, a Washington DC-based nonprofit and advocacy group, told the Guardian. This week, HSBC’s top management finally apologized when they were ordered to testify before the UK parliament. ““We have absolutely no appetite to do business with customers that are evading taxes,” Stuart Gulliver, HSBC CEO, said in an official statement. But Gulliver had a lot of difficulty explaining the tax affairs of one of the bank’s customers who was evading taxes – himself. On Monday, the Guardian revealed that he had personally hidden £5 million ($7.7 million) in a Swiss account via a Panamian subsidiary. Gulliver admitted that the money was hidden for the purposes of tax evasion. “Being in Switzerland protects me from Hong Kong, being in Panama helps protect me from the Swiss bank,” he said.